This has been a weekend full of family birthday parties. We just got back from celebrating our twin niece and nephew's 11th birthday and soon will be leaving to pick up our younger son who is coming home for his college spring break. For the party, I made a second card for my niece (I posted the card for my nephew a few days ago). 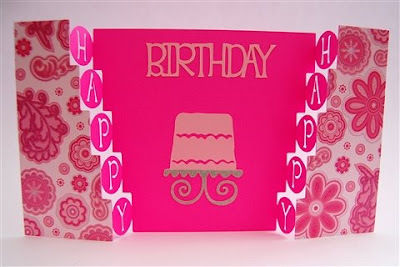 I added the photo here to show what a difference a color scheme can make - the only thing that is the same on both cards is the design and the silver glitter cardstock cake stand. The photo above was taken with flash and shows the sparkle of the cakestand. I have a lot of projects going right now - unfortunately, many of them are for swaps (and need to stay "secret"), so I won't be able to post them for a little while. I also have been fairly unavailable for the past few days. I am sorry if you have left me a message and I haven't responded yet - I hope to be able to do some catching up tomorrow. IMPORTANT NOTE: When I cut the card for my niece, I discovered that the word "birthday" was not welded even though I had tested both files. I imagine the weld button was unticked when I was setting the file up with a preview tab and I missed rechecking the box. I have corrected the file in the download link - if you downloaded the Plantin Schoolbook version you should redownload or just remember to select "Birthday" and check weld when you work from the cutting page. 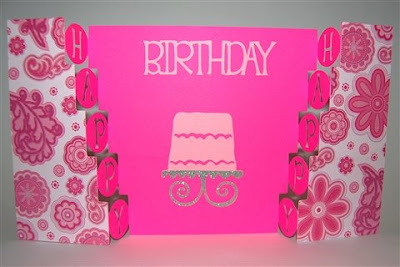 This is such a pretty card - I'm sure she loved it! I have boy girl twins too (they are 2) - and it's nice that you made them each their own card! oops lets try this again. I apologize for calling you Sandi. Diane you are so creative and your talent is truly a gift. Thank you for sharing them with us. What a great card this is. Thank you for always sharing your designs with us. You give me so many ideas. Thanks for such a great and fun design. 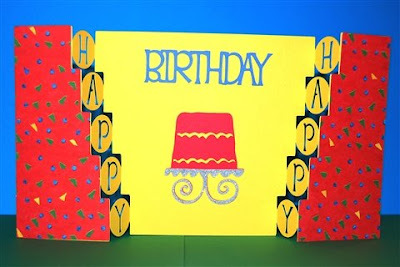 I saved it a couple of months ago when you posted it and just used it today to make a card. You have such a great blog! Thanks for sharing your amazing talent!